I don't have any food allergies that I know about, but I'm always interested in trying recipes designed for restricted diets, because I think it's interesting to see how people work around the restrictions. So, when my buddies at 37 Cooks tossed a copy of Sweet Debbie's Organic Treats at me, I knew I'd find something fun to make. 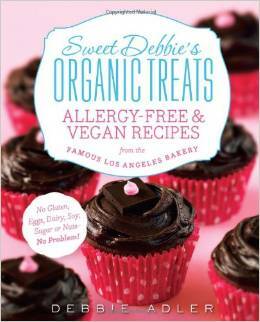 Besides focusing on organic, the recipes are also allergen-free and vegan. So, no gluten, nuts, dairy ... all those things that I bake with all the time. Many of the recipes used coconut oil and coconut nectar, including the one I chose. I happened to have a jar of coconut oil, so that was good. I didn't have coconut nectar, and after some shopping, I couldn't find it anywhere. I did some reading and found that agave nectar and honey were both acceptable substitutes. I had plenty of honey, so I chose to use that. Afterwards, I remembered that honey isn't a vegan product. But I wasn't planning on feeding any vegans, so I figured it would be fine - at least from a "will this recipe work" standpoint. The recipe also called for 3/8 teaspoon of stevia powder, which I also didn't have. Since stevia is a sweetener and I had plenty of honey in the recipe, I decided to skip it. Many sources I looked at said that honey was sweeter than coconut nectar, so I figured I would be fine. I didn't have guar gum and couldn't find it when I went shopping, but the book suggested that xanthan gum is an acceptable alternative, so I used that. I was pretty happy with these cookies. I'm not a big fan of coconut, so I wasn't shoveling these into my mouth with wild abandon, but the chocolate flavor was definitely prominent. For the gluten-free flour mix, I used the all purpose baking mix from King Arthur Flour ; the book also has a recipe from making your own flour mix. For the chips, I used Nestle's, even though I'm pretty sure they're not organic. You might be wondering about the gluten free oats. Here's the deal. Oats themselves don't have any gluten, but many oats are processed in facilities that process other grain products that do contain gluten. Because of that, they can't be labeled gluten free. So if you're cooking for someone who needs to avoid all gluten, you need to buy oats that are processed in a facility that's gluten free. The book has recipes for making your own dark chocolate chips, if you prefer to do that, and you need to control absolutely every ingredient in your baking. Preheat the oven to 325 degrees and line one or two baking sheets with parchment paper. These don't spread much, so you might be able to squeeze all the cookies on one sheet, but I found it was easier to just use a second sheet. In a medium bowl, whisk together the flour mix, cocoa powder, baking soda, xanthan gum, and salt. Put the coconut oil and nectar (or honey or agave) in a microwave-safe measuring cup or small bowl and heat for 20-30 seconds. Add the vanilla extract and the stevia (if you're using it) and stir well. The coconut oil should melt. Add the coconut oil mixture to the flour mixture, along with the water. Stir until all the liquid is absorbed and the mixture is evenly wet. Add the oats and the chocolate chips and stir to combine. Portion the cookie dough onto the prepared baking sheets. I made about 20 cookies. Flatten the cookies with your palm or with the bottom of a measuring cup or glass. Bake at 325 degrees until the cookies are set and the oats look dry, about 13 minutes. If you're baking more than one sheet at a time, or if your oven doesn't bake evenly, rotate the pans in the oven partway through the baking time. Transfer the pan to a cooling rack and let the cookies cool for about 10 mintues before removing them from the pan and letting them cool completely on a rack. Disclaimer: I received this book from the publisher through 37 Cooks.